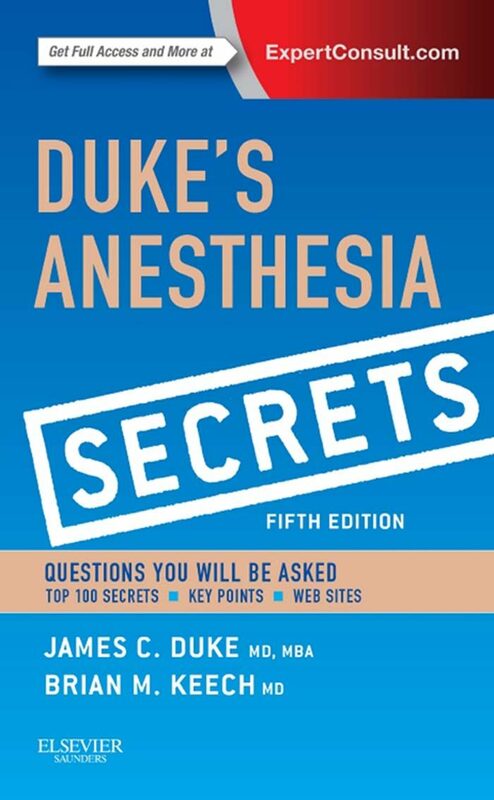 Get quick answers to the most important clinical questions with Duke’s Anesthesia Secrets, 5th Edition! Authors James Duke, MD and Brian M. Keech, MD present this easy-to-read, bestselling resource that uses the popular and trusted Secrets Series® Q&A format. It provides rapid access to the practical, "in-the-trenches" know-how you need to succeed – both in practice and on board and recertification exams. Zero in on key information with bulleted lists, tables, mnemonics, illustrations, practical tips from the authors, and "Key Points" boxes that provide a concise overview of important board-relevant content.Review essential material efficiently with the "Top 100 Secrets in Anesthesiology" – perfect for last-minute study or self-assessment.Get the evidence-based guidance you need to provide optimal care for your patients – ideal for medical students, residents, fellows, and practitioners.Apply all the latest advances in techniques, technology, and pharmacology, and explore effective solutions to a full range of clinical issues in anesthesiology. .
Otros ebooks de James Duke.